Chapter 8: Jesus heals the leper (vs 1-4), Jesus heals a centurion’s servants (vs 5-13), Jesus heals many at Peter’s house (vs 14-17) , Jesus heals the Gadarene Demonics (vs 28-34). Chapter 9: Jesus heals a paralytic (vs 1-8), a girl restored to life and a woman healed (vs. 18-26), Jesus heals the two blind men (vs 27-31), Jesus heals the mute man (vs 32-34). I sometimes catch myself thinking that it might have been much easier to follow Jesus if I had heard him preach and witnessed his miracles. But I fear that while I would have been curious about what Jesus was saying and doing I would probably be like the masses who within hours of witnessing miracles were finding fault in him and calling for his crucifixion. Perhaps this is why immediately after healing the two blind men Jesus “sternly” ordered the people not to speak about this healing. But the people couldn’t help themselves and “spread word” everywhere. In his homily at Mass on the final morning of last month’s Christchurch priests’ retreat Bishop Paul Martin spoke about the importance of words as a tool of sharing our life of faith. He suggested that the saying attributed to Francis of Assisi (Preach the gospel at every moment and if absolutely necessary use words) is too often used to downplay the importance and power of words. “…let your words be rivers, clean and limpid, so that in your exhortations you may charm the ears of your people. And by the grace of your words win them over to follow your leadership… Solomon says: The weapons of the understanding are the lips of the wise; and in another place he says: Let your lips be bound with wisdom. That is, let the meaning of your words shine forth, let understanding blaze out. See that your addresses and expositions do not need to invoke the authority of others, but let your words be their own defence. Let no word escape your lips in vain or be uttered without depth of meaning”. Office of Readings for 7 December Feast of St. Ambrose. Take the opportunity today to carefully choose and share some words as an encouragement for a friend, family member, work-mate and also for a stranger you pass by chance. Throughout the day ahead look for evidence in your own life that the age of miracles is not past. Like those who witnessed Jesus miracles, share your own experience of the presence and action of Jesus in your life with a friend or perhaps with Food For Faith readers as a comment below. 8 Responses to "words & miracles"
Food For Faith replenishes my being – I appreciate your exemplary depth of understanding of ‘the way, the truth and the light’. 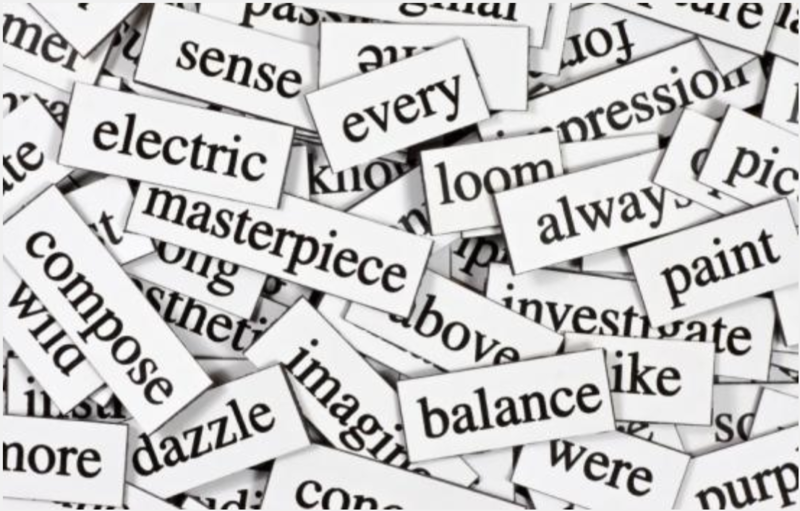 Your creative ingenuity mirrors the gifts of words and miracles in our daily lives. Blessings in return, Virginia. At this busy time it is good to take time and read your daily readings before rushing into the day. Very re-assuring. Isn’t today a special one for you, 32 years? Miracles happen. Aside from the fact that He protects me in ways I may never know, He also heals me spiritually and physically. Some time ago members of the ministry team came to pray for the healing of internal abscesses. While they prayed I physically felt warm, wet oil (about a cups worth) hit my head and run down my back although the ministry team had left their annointing oils behind. I guess God thought I needed an annointing and gave me one. Needless to say the abscesses began healing and were gone within a few days. Praise to you Lord Jesus Christ, King of endless glory. I love collective nouns. When I was the CSO stage manager I was asked in a radio interview what would be the collective noun for a gathering of stage managers and proffered a “muddle of stage managers”, and after a family gathering what is a collective noun for the Kennedy family members, and as we are always bossy, and right, and know everything I came up with a “pedant of Kennedys”. I always look forward to your suggestions of what we could achieve each day in a practical and Christian way. Dear God please help me to remember as the day quickly passes. Miracles and words – Both came to me in a time of challenge and grief. My husband had just left me and an older woman appeared at my place of work- which happens to be next to the church. This woman was in distress and wanted a priest to speak with. I told her across to the parish office but no-one was there. What was I to do ? I asked if she wanted to talk to me – we could talk in the church. She took up my offer and proceeded to share how she was wanting to leave her husband and how terrible she felt but knew it was the right thing to do. She was anxious about sharing this with me as she assumed I was happily married and had no idea of the pain I was feeling at my own time of loss. The miracle was she helped me to forgive, I never saw her again, ever. But that day I was healed of my bitterness and my self pity. Her words were my healing. My miracle came first thing this morning. I had asked God that I might see a certain person who was undergoing some troubles and that I would be guided in conversation. Within an hour we ‘bumped into each other’, and we talked together for a while. She walked away knowing she was cared for, and I walked away thanking God for grace and answer to prayer. 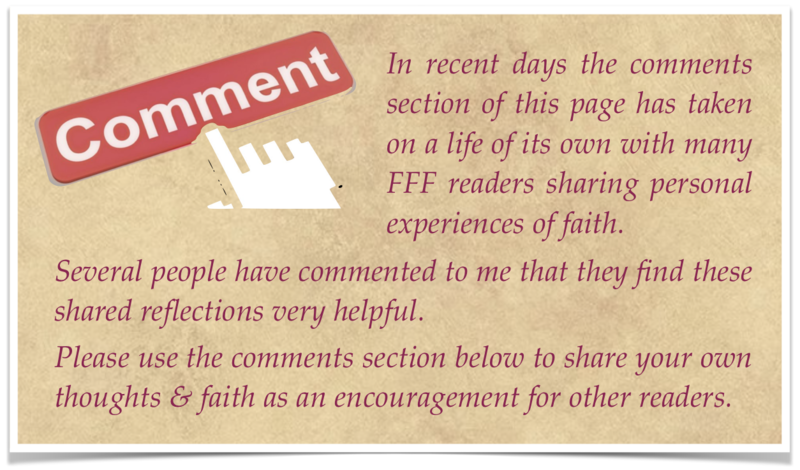 You are welcome to share content on this website (acknowledging www.foodforfaith.org.nz) for non-commercial use. Produced with the support of the Catholic Diocese of Christchurch, New Zealand.